SCVHistory.com | Law Enforcement | De Moranville Slaying: Killer of Newhall Deputy Walks, 1909. De Moranville Slaying: Killer of Newhall Deputy Walks. 'Arizona Jack' Allen had been carousing at Nick Rivera's Newhall saloon; was walking to Kellogg ranch in Saugus when he supposedly mistook officer for robber. Justice Powell tells how constables and judges were paid per arrest. Left: John W. "Arizona Jack" Allen, the shooter. 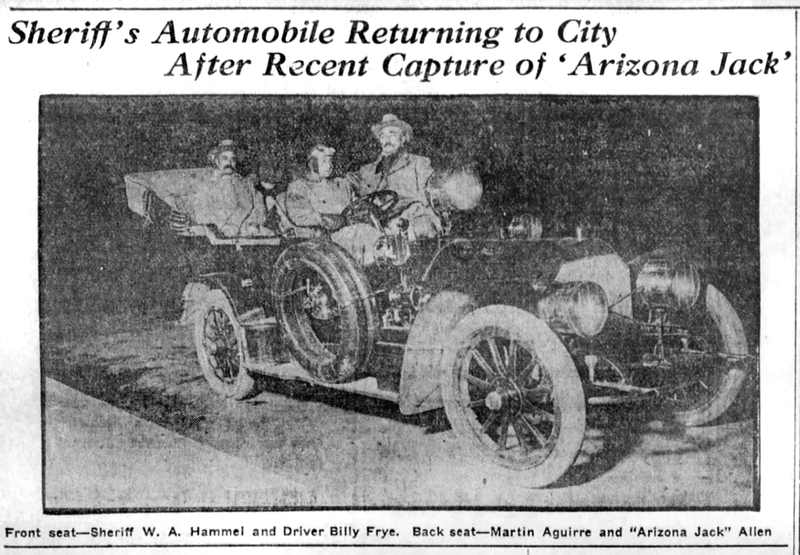 Right: "Sheriff's Automobile Returning to City After Recent Capture of 'Arizona Jack.'" Photograph from January 1909, but published with a Los Angeles Herald feature story July 25, 1909, after Allen already had been freed. Original caption reads: "Front seat - Sheriff W.A. Hammel and Driver Billy Frye. Back seat - Martin Aguirre and 'Arizona Jack' Allen." Click images to enlarge. Forced by Sheriff Hammel to Surrender. Says He Mistook Constable for Holdup Man. Had Been Hiding in the Foothills, but Came Down at Nightfall to Ranch for Food and Shelter. Los Angeles Herald | Wednesday, January 6, 1909. 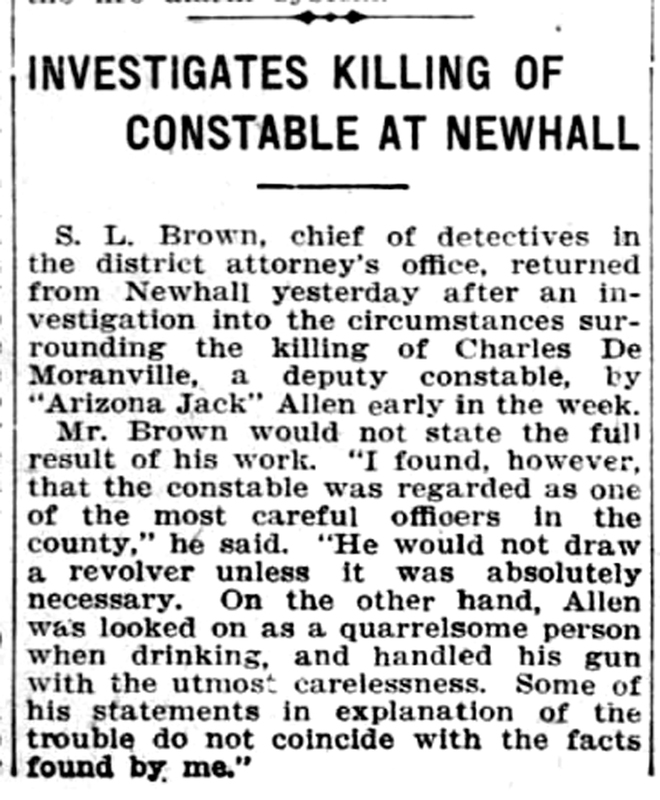 John H. Allen, "Arizona Jack," who shot and killed Deputy Constable Charles de Manville [sic] at Newhall Monday night, was captured at the old Kellogg ranch near Newhall last night by Sheriff W.H. Hammel and Deputy Sheriff Martin Aguirre. He was brought to Los Angeles and placed in the county jail with the charge of murder against his name. Allen, who is a small wiry man, 35 years of age, tells a story of the shooting which places an entirely different complexion on the affair. According to the account by the prisoner at the county jail last night he had been in Newhall Monday night drinking, and for noisy and boisterous conduct he had been ejected from a saloon there. From the saloon he went to a show in the opera house, and after the show returned to the saloon and got something to drink; after that he started to walk to the Kellogg ranch, where he was employed. When he got to the edge of the town five men who had dropped off a freight train some time previously, and had seen him in the saloon spending money, attempted to hold him up. He resisted them and when he succeeded in getting loose from them drew a revolver and fired several shots at them. The men disappeared in the darkness, going toward the town, and a few minutes later a man who proved to be Deputy Constable de Manville came up to him and pointing a gun at him ordered him to throw up his hands. Allen thinking it was one of the men who had attempted to hold him up started to draw his revolver again and De Manville fired three shots at him, two of which went wild, while the third passed through his coat, burning him along the side of the back. At the third shot Allen drew his revolver and fired one shot at the officer. This ran up his arm, penetrated his breast, entered his heart and killed him instantly. Allen then made his way to the old Kellogg ranch and passed the night in the barn after getting something to eat. Yesterday he went to the new Kellogg ranch and told his employer, Charles Kellogg, of the shooting. He then went into the foothills near by. Kellogg notified Constable Pardee and he notified the sheriff of Allen's probable whereabouts. Sheriff Hammel and Deputy Aguirre went to the old Kellogg ranch yesterday afternoon and scouted all through the foothills near there without finding any trace of Allen. They waited, however, at the ranch and last night shortly after 7 o'clock Allen came down from the hills to get something to eat and to sleep in the barn. As he was approaching the barn Sheriff Hammel held him up with a rifle and arrested him. He was brought at once to this city. Cowboy Relates Plausible Story of Newhall Shooting. Arizona Jack Declares He Believed Constable Was Trying to Hold Him Up — Shot in Self-Defense. Los Angeles Herald | Thursday, January 7, 1909. 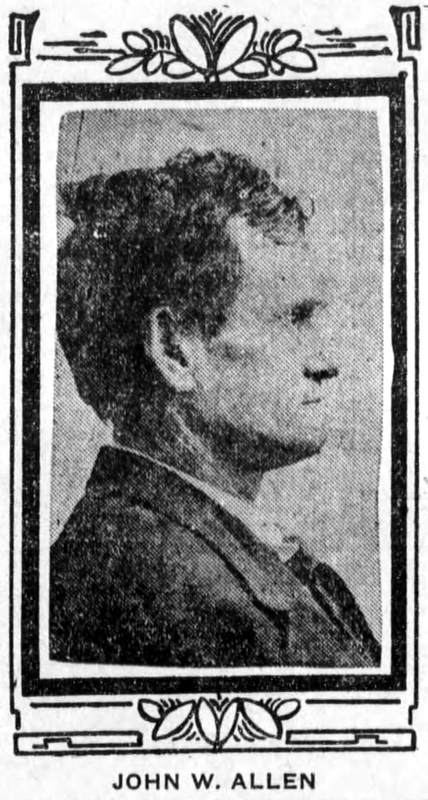 The arraignment of John W. Allen, known as "Arizona Jack," who is charged with killing Charles de Morganville [sic], a deputy constable, at Newhall, was set for 10 o'clock Saturday by Justice Summerfield yesterday. Allen was in the little justice courtroom only a few minutes yesterday. He is a small, wiry man, mild in manner and exhibiting none of the peculiarities commonly attributed to desperadoes. He accepted his position calmly and explained, with a marked southern accent, the circumstances leading up to the shooting. "I came to Los Angeles from Evelyn & King's ranch in the Coahuila [sic] valley Monday morning," he said. "I was paid off here and decided to stop off at Newhall on my way back to the ranch. Had a number of friends in the town. I am a free spender when I have money and had a good time at Newhall with the boys. "That night four or five men held me up, cut my trousers pocket and broke my watch chain. I got away from them. A little later I met De Morganville. It was dark and I did not recognize him. I believed he was one of the holdup men, and when I refused to hold up my hands he fired, and I returned the fire." Allen showed two holes in his shirt and a burned spot on his back made by the constable's bullet, and another mark was found on a finger of the left hand which Allen claims was made by a second bullet. Three chambers in De Morganville's revolver were found to be empty. Allen is a Mississippian. He left home about ten years ago, going to Arizona, where he became a cowboy. Later he prospected in California, and about four years ago went to the Evelyn ranch in Coahuila valley, where he has since been employed. "I have a number of relatives in Mississippi," said Allen, "and expect there will be no difficulty in getting financial help for my defense." Physician Examines Marks Left By Bullets. Dr. C.F. Shurtleff Finds Burns on Shoulder and Abrasions on Finger of "Arizona Jack" Allen. Los Angeles Herald | January 8, 1909. Dr. C.F. 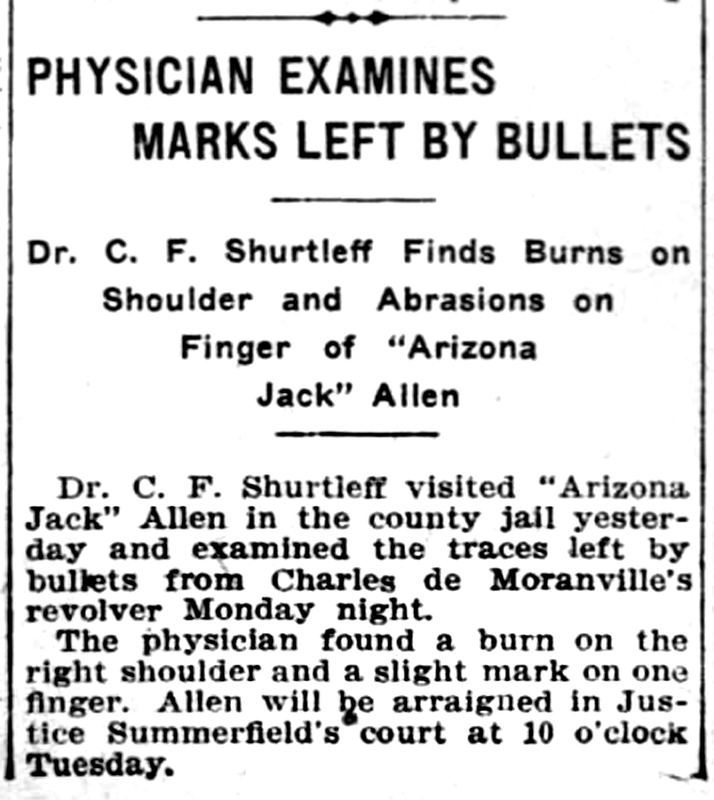 Shurtless visited "Arizona Jack" Allen in the county jail yesterday and examined the traces left by bullets from Charles de Moranville's revolver Monday night. The physician found a burn on the right shoulder and a slight mark on one finger. Allen will be arraigned in Justice Summerfield's court at 10 o'clock Tuesday. Investigates Killing of Constable at Newhall. Los Angeles Herald | January 10, 1909. S.L. Brown, chief of detectives in the district attorney's office, returned from Newhall yesterday after an investigation into the circumstances surrounding the killing of Charles De Moranville, a deputy constable, by "Arizona Jack" Allen early in the week. Mr. Brown would not state the full result of his work. "I found, however, that the constable was regarded as one of the most carful officers in the county," he said. "He would not draw a revolver unless it was absolutely necessary. On the other hand, Allen was looked on as a quarrelsome person when drinking, and handled his gun with the utmost carelessness. Some of his statements in explanation of the trouble do not coincide with the facts found by me." Slayer of Constable to Be Examined January 25. Counsel for Prisoner Asks Court to Take Charge of Garment Now in District Attorney's Custody. Los Angeles Herald | January 13, 1909. Preliminary hearing of John w. Allen, charged with the murder of Charles De Moranville at Newhall, January 4, was set for January 25 by Justice Summerfield yesterday, and he was remanded to jail without bail. Allen's attorney, Fred Thompson, requested the court to take charge of his client's clothing worn at the time of the shooting and in which there are bullet holes. 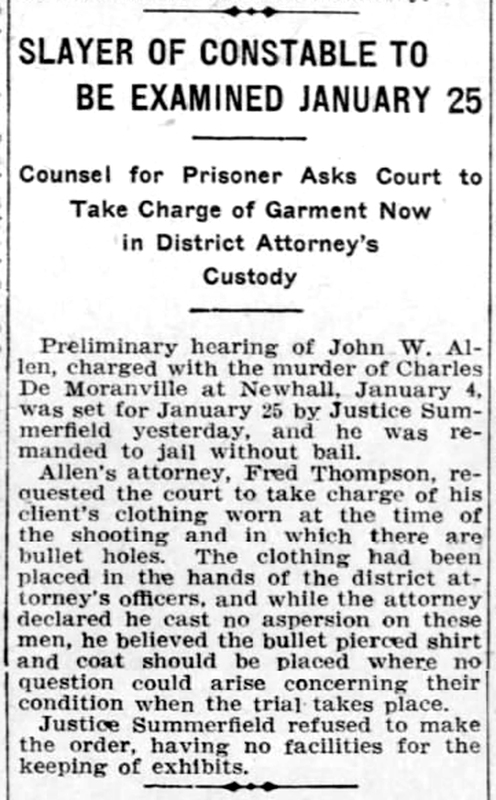 The clothing had been placed in the hands of the district attorney's officers, and while the attorney declared he cast no aspersion on these men, he believed the bullet pierced shirt and coat should be placed where no question could arise concerning their condition when the trial takes place. Justice Summerfield refused to make the order, having no facilities for the keeping of exhibits. Defense of "Arizona Jack" Impeded. Deputy Constable from Newhall Unable to Remember Details When He Is Called to Testify. Los Angeles Herald | February 25, 1909. A witness, whose lack of memory would make him a valuable assistant to Archbold, Rockefeller or others whose chief asset is their forgetfulness, testified in Justice Summerfield's court yesterday in the preliminary hearing of J.W. 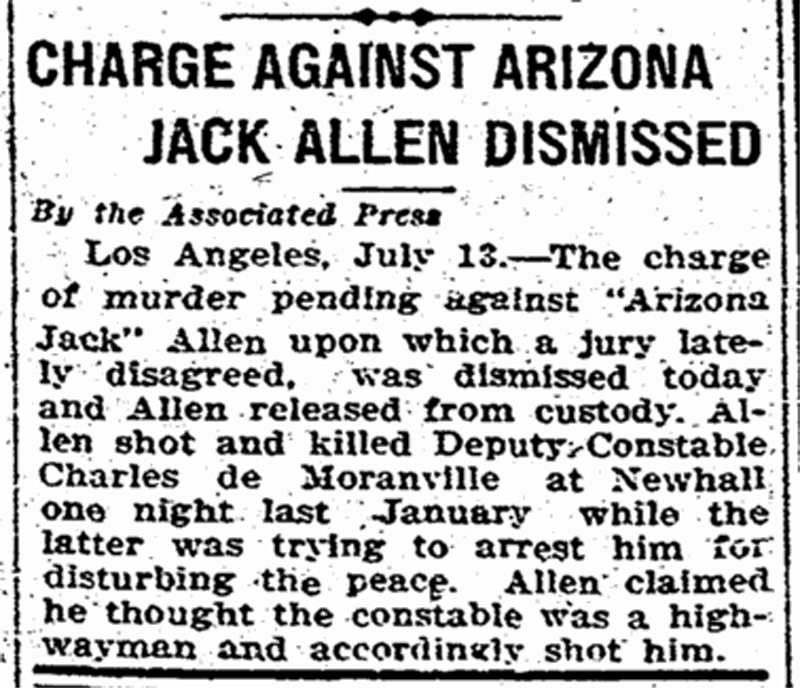 Allen, better known as "Arizona Jack," charged with the killing of Constable Charles de Moranville. This witness was Constable Pardee of Newhall. Attorney Fred Thompson, for the defense, made a motion to have the case dismissed on the ground that the state had failed to establish a case against Allen. When this was denied the witnesses for the defense were called. The first witness was Constable Pardee, whose seeming forgetfulness hampered the defense considerably. It was necessary to question him from many sides in order to get anything from him. De Moranville was deputy constable under Pardee. Allen contends that he was under the impression that he was being held up by robbers when he shot De Moranville. To establish this point Constable Catlin of Burbank, when he was called to the stand, was asked to show exactly how the dead officer wore his star. Catlin illustrated by pinning a star over his upper pocket on the left side of his vest. The defense, by this, will attempt to show that Allen could not have seen the officer's star on the night of the shooting. All day was consumed in the taking of testimony, and the case probably will be concluded today. Ring May Upset Robbery Plea. Finding of Jewelry Figures in Allen Case. Accused Man Will Be Asked for Explanation. Prosecution Will Attempt to Prove That Story of Holdup Told by Prisoner is Untrue. Los Angeles Herald | June 3, 1909. An effort to impeach the testimony which it is thought will be introduced in behalf of John W. Allen, on trial in Judge Davis' court on a charge of killing Charles de Moranville, a constable of Newhall, January 4, was made yesterday by Deputy District Attorney Keyes, who placed in evidence a watch fob and a ring, formerly owned by Allen, it is said, and which were found by Joseph R. Moore, a Newhall rancher, ten days after the shooting. It is understood Allen's defense will be that he was held up the night of the killing and that his watch fob was snatched from his person. A short time later, when another man approached him in the darkness, he believed he was about to become the victim of a second robbery, and fired several shots. One of these is believed to have killed De Moranville. Moore said he found the fob and ring under a barbed wire fence, 200 feet from the spot where the constable's body was found, and along the route said to have been taken by Allen after the shooting. Dr. George W. Campbell, who performed the autopsy on De Moranville's body, was the first witness yesterday. He examined the body the day after the shooting, he said, and found that the bullet, evidently discharged from a 32-caliber revolver, had penetrated the right side, near the armpit, and, passing through the fourth rib and a lung, had lodged under the skin, almost directly opposite to the point of entrance. Petro Castreno, called to detail De Moranville's movements immediately preceding the shooting, aided somewhat the theory of the defense that Allen fired when he believed he was about to be robbed, by stating, in reply to questions propounded by Allen's attorneys, Fred Thompson and Dudley Robinson, that the night was quite dark and that it would be difficult to distinguish a person's identity, even at a short distance. Frank I. Putka, a bartender employed at Rivera's saloon, said Allen came to the saloon about three hours before the shooting, left his belongings, but failed to return for them. The trial will be resumed today. Man's Fate May Hang on Thread. Prosecution Rests in Allen Murder Case. Accused Denies Crawling Through Fence. Says He Shot at Person He Supposed Intended to Hold Him Up on the Lonely Road. Los Angeles Herald | June 4, 1909. When the prosecution rested yesterday in the trial of John W. Allen, "Arizona Jack," charged with killing Charles de Moranville at Newhall January 4, Allen's fate apparently hung on a shred of cloth, torn from his coat by the barb of a wire fence, it is claimed, while he was making his escape from the scene of the killing. Further evidence was introduced to show that Allen's watch fob was not snatched from him by robbers, but was also lost when he crawled through the fence. Allen says he ran along the railroad track after he fired a shot at a man he believed was about to hold him up and that he did not, according to the theory of the prosecution, pass through the fence on either side. Charles H. Kellogg, a rancher at Saugus, said Allen appeared at his place the day after the shooting and was arrested there by Sheriff Hammel. The most direct route to the ranch, he said, was along the railway. The sheriff was also a witness, testifying that Allen made no resistance when he was arrested. "I asked him if he knew he had shot a man the night before," said the sheriff, "and he replied that he would not admit he had shot anybody. I told him he was charged with killing De Moranville, and he said, 'Why, I wouldn't hurt Charley for the world; he was one of my best friends.'" The defense will begin introducing testimony this morning and is expected to close by the time court adjourns this afternoon. It is probable Judge Davis will continue the case for argument until Monday. John Allen Named in Old Arkansas Case. Book Agent Identifies Man On Trial Here. Defendant Tells of Manner in Which Charles de Moranville Was Killed at Night Near Newhall. Los Angeles Herald | June 5, 1909. A surprise was sprung yesterday in the trial of John W. Allen, charged with killing Charles de Moranville January 4, when, in rebuttal, Deputy District Attorney Asa Keyes introduced a certified copy of court proceedings at Little Rock, Ark., in 1888, showing that a man supposed to have been the defendant was convicted of murder and sentenced to five years in the Arkansas penitentiary. Allen was identified by a former resident of Little Rock, Douglass Norwood, a book agent, as the man convicted more than twenty years ago, but before the prosecution could follow up its effort to prove that Allen is a desperate character Judge Davis ruled that all the evidence in this connection must be disregarded by the jury, owing to the fact that the Arkansas certificate was not properly certified. That the principal purpose for the creation of the office of deputy constable at Newhall was to enhance the financial fortunes of the incumbent was apparent in the early hours of the trial yesterday, when Allen's attorneys began the introduction of testimony. J.F. Powell, a Newhall justice, was the first witness called. Seventy-one arrests, he said, had been made by De Moranville as deputy constable in the month of December, last year, and of this number there were sixty-eight convictions. The expense to the county totaled $699.25, or $4.15 in each case where the prisoner was released and $10.10 where a conviction and sentence to a term in the county jail resulted. In each case the justice received $3 for issuing the complaint, $1 was paid to the deputy for making the arrest, 15 cents for mileage to the justice court, $3.95 for mileage to the county jail and $2 railroad fare for the officer accompanying the prisoner. Justice Powell said it frequently happened that many of the persons arrested were released when it was discovered they were supplied with sufficient funds to maintain themselves. "I went to Newhall January 4 from the Chilo valley, where I had been working. That night about 7 o'clock, while I was on my way to Kellogg's ranch, some person standing about 800 feet away ordered me to throw up my hands. As I turned I slipped on a nail and fell, and as I struck the ground a gun flashed. I sprang to my knees and the gun flashed again and I flashed back. Then I jumped to my feet, and as the gun flashed once more I fired at the flash. The man ducked out of sight. The first shot passed between my fingers and burned my back. "I left the track and bent my body, figuring to shoot at the flash if it should come again. I thought the man was hiding behind some obstruction. I waited a few seconds to receive his fire, but everything was quiet. Then I walked along the fence some distance and again took to the railroad." Allen said he looked upon De Moranville as the best friend he had in Newhall. Allen's attorneys, Thompson, Robinson & Willis, announced that their case was closed, and Deputy District Attorney Asa Keyes, in rebuttal, introduced a certified copy of an Arkansas court proceeding singed by the county clerk of Pulaski county and secured by S.L. Browne, chief of the district attorney's criminal bureau, in his investigation into Allen's past life. The document was not read to the jury, being ruled out by the court on account of improper certification. This ruling was not made, however, until after Douglass Norwood, a book agent, living at 640 Bixel street, identified Allen as the same person named in the paper as having been convicted on a murder charge in Arkansas. 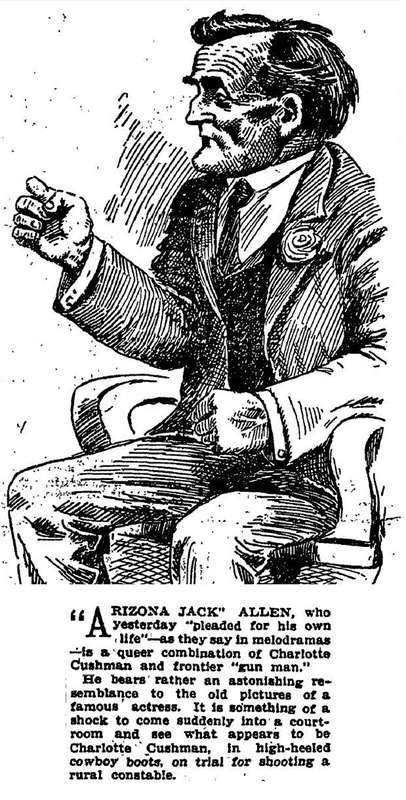 Allen, according to the record shown to the court, was tried and convicted in June, 1888, for the killing of Amos Welchell in a fight which started in a dance hall at Little Rock a month previously. The night of the killing, the report says, one of the dancers, a man named Baur, came upon Allen while the latter was sharpening a knife at the rear of the dance hall, and when asked what he was doing Allen is said to have replied: "I'm going to cut some flesh tonight." A few hours later Welchell's body was found, slashed in a terrible manner. Allen was not called to the stand to refute the testimony regarding the Arkansas killing. When questioned by his attorneys, however, he stated that he was in Macon, Miss., in 1888; that the tax rolls in that city would bear him out in his assertion; that he had never heard of the Welchell case and never saw Norwood before he entered the court room to testify against him. The case was continued until Monday, when arguments will be made, and the jury probably will retired to decide upon a verdict by noon that day. Los Angeles Times | June 5, 1909. "Arizona Jack" Allen, who yesterday "pleaded for his own life" — as they say in melodramas — is a queer combination of Charlotte Cushman and frontier "gun man." He bears rather an astonishing resemblance to the old pictures of a famous actress. It is something of a shock to come suddenly into a courtoom and see what appears to be Charlotte Cushman, in high-heeled cowboy boots, on trial for shooting a rural constable. Claims He Mistook Officer for Robber. San Francisco Chronicle | June 5, 1909. Los Angeles, June 4. 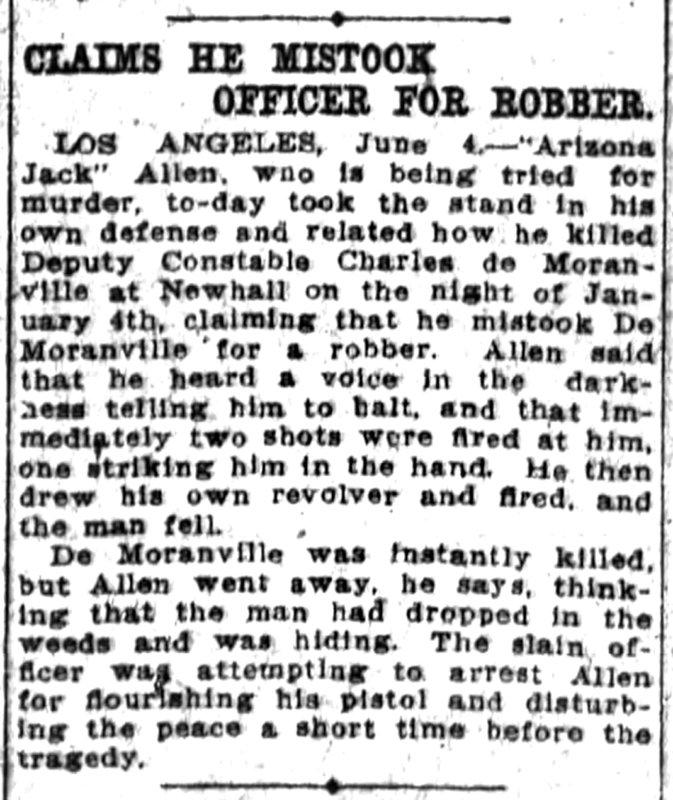 — "Arizona Jack" Allen, who is being tried for murder, to-day took the stand in his own defense and related how he killed Deputy Constable Charles de Moranville at Newhall on the night of January 4th, claiming that he mistook De Moranville for a robber. Allen said that he heard a voice in the darkness telling him to halt, and that immediately two shots were fired at him, one striking him in the hand. He then drew his own revolver and fired, and the man fell. De Moranville was instantly killed, but Allen went away, he says, thinking that the man had dropped in the weeds and was hiding. The slain officer was attempting to arrest Allen for flourishing his pistol and disturbing the peace a short time before the tragedy. Charge Against Arizona Jack Allen Dismissed. By The Associated Press | As published in the San Diego Union | July 14, 1909. Los Angeles, July 13. — The charge of murder pending against "Arizona Jack" Allen upon which a jury lately disagreed, was dismissed today and Allen released from custody. Allen shot and killed Deputy Constable Charles de Moranville at Newhall one night last January while the latter was trying to arrest him for disturbing the peace. Allen claimed he thought the constable was highwayman and accordingly shot him.